Even in this digital age, black and white photography remains a touchstone of the art. No wonder every imaging program has simple tools to convert color images to grayscale. However, none of those utilities gave us the kind of accessible creative control over quality, grain, tonality, and dynamic range that we used to have in our old film darkrooms... until Nik Software Silver Efex Pro ($200, 15-day free trial) came on the scene. Silver Efex Pro is a Photoshop-compatible plug-in utility. That means it will work from within most mainstream imaging programs, such as Photoshop, Corel PaintShop Pro, Apple Aperture and Ulead PhotoImpact. 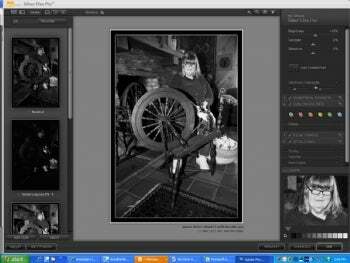 With your picture open in the imaging program, click on Silver Efex Pro, to gain access to full and precise control over the b&w conversion. Silver Efex Pro has its roots in the high art of photography. This includes the ability to emulate the natural film grain of popular films such as Kodak 32 ISO Panatomic X or Ilford Delta 3200 Pro. You can analyze your image using an Ansel Adams-like 10-step dynamic range to make sure you're content with the photo's values from shadows to highlights. You can also apply various color photo filters or toning (such as selenium or sepia). In addition to global controls over brightness, contrast and structure, you can apply such edits to precisely selected areas of your picture. Although other programs' one-button corrections can be easy Silver Efex Pro provides the power of full customizability for greater creative control, in addition to saving user-defined presets and downloading presets created by other users. The resulting b&w version of your picture can be applied to your original image as a layer, or you can brush it onto specific areas of your picture. It has been a long time since we have been as impressed with an imaging program as we are with Silver Efex Pro. It actually aces our old darkroom in fun, creativity and power--without all the chemical fumes.